As an NC40 girl, I'm kind of on the cusp of where the shade selection deteriorated! 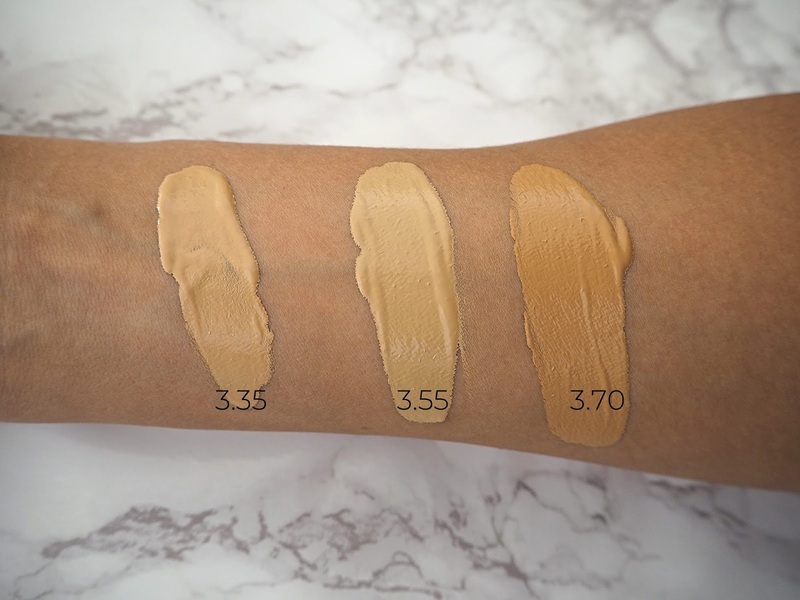 My closest match is the shade 3.70 which is way over on the darker end of the spectrum, which seems off given that I'm pretty 'slap bang in the middle' when it comes to the range of human skin tones... I have three shades here as it just felt a bit wasteful to take all of the colours I knew I'd have no use for, and there are enough swatches and videos on the internet showing what they all look like. There are a couple of shades in-between the ones I have, but some of them are cool-toned so wouldn't be right for me. I think the photos are really misleading too, as they show people with darker skin than me wearing far lighter shades than mine. 3.70 can also only loosely be described as a 'match' - as people have pointed out from the photos online: these shades do run very orange-toned. I can just about get away with it now, after being on holiday in Italy and getting some serious colour whilst I was there. I know this is going to be a no-go when that fades and we head into the colder months. I can get something that looks decent by mixing in a bit of 3.55, but realistically; I shouldn't have to and you guys aren't reasonably going to purchase more than one shade of this just to get a colour match when there are other foundations out there. It also defeats the functionality of the packaging to faff around with two bottles. On the positive side: the packaging is genius! I've said it before and I'll say it again: a lot of brands try to innovate and end up missing the mark, giving us gimmicky products that no one really asked for... However this is genuinely a brilliant concept! I honestly think the packaging is what everyone would be going on about, had the shade selection been more inclusive. 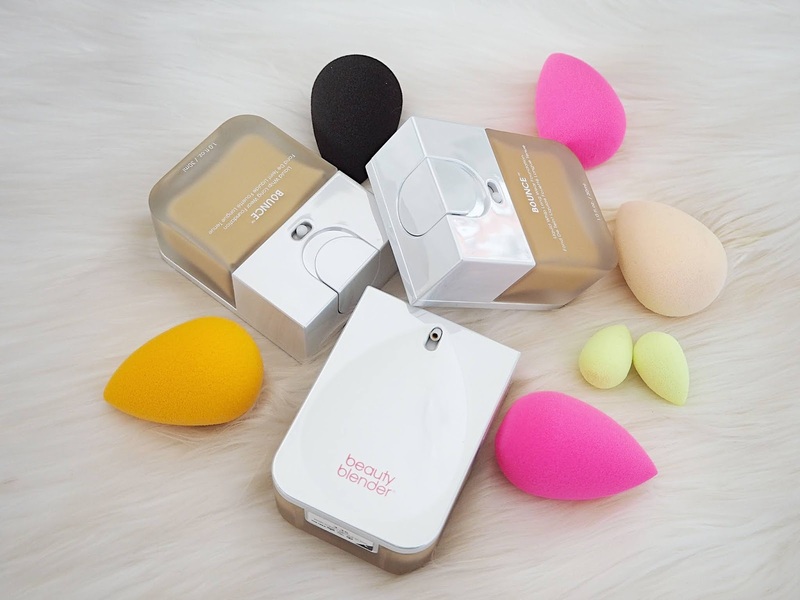 This has a plastic side shaped to fit your BeautyBlender and the nozzle points downwards so the foundation goes onto the surface and you bounce the sponge directly on there and apply. That means no more messy hands when putting on your foundation! You simply pump the product out from the top and you can lock it so it doesn't accidentally go all over your makeup bag. I would honestly buy an empty refillable version of this if it was available - I think it's a fantastic idea but I'm just not so mad about what's inside. But, what about the formula? This was the main reason I was curious to try this foundation! Throughout the debate and discussion on this launch, I was sat wondering if it was actually a good foundation that people would love if they could get a match in it. I only really wear full coverage for nights out, so I was a bit apprehensive to test this out, however it's actually quite buildable. I'd say you have to work fast to blend it out (of course I used a BeautyBlender, though I do this with all of my liquid bases) as it sets down quite quickly, and two pumps is about right for me. It's a medium to full coverage that leans more towards 'full' once applied and has a finish that looks semi-matte but isn't drying on the skin. It definitely evens out my skin tone and makes things look more flawless. Have you tried / will you be trying this foundation?